A post graduate in Arts from Ravenshaw College, Orissa, India, Mr. B. K. Misra taught English literature for 13 years in various universities including 7 years in his alma mater. In 1966, he came into Bhagavan’s fold under amazing circumstances, and since then longed to serve at His Lotus Feet in Prasanthi Nilayam. His dream was fulfilled in 1980 when he joined the Sri Sathya Sai Higher Secondary School, where he serves till date even after retirement. It is not often in today’s world that we have reason to cheer about positive developments in society. There seems to be so much chaos and selfishness around. Partly this is, in fact, the case, and partly the fault of a sensationalist and negative media, which refuses to give its readers ‘good news’. We, in H2H, are passionate about bringing to you such stories which inspire our minds and strengthen our souls. And if only we look around to see what Sai devotees, especially Sai students, are engaged in - many silently, but solidly – such tales of celebration of the true human spirit are plenty. One such brilliant example is ‘Sai Anandam’. Read this touching tale to find out how one spirited soul, guided by his beloved Sai and aided by other Sai students and well-wishers, has created a home where buds, who would otherwise have dried, devastated or decomposed, are today blooming into beautiful blossoms, all because of their love for Him and His Love for them. 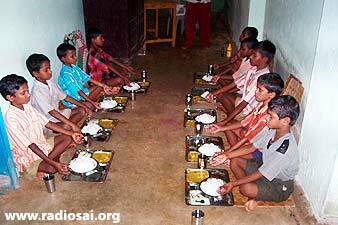 “Sai Anandam”, (meaning ‘Sai Bliss’) is the apposite name for a home for destitute children, set up by former students of Sathya Sai Baba in the north-eastern Indian state of Orissa, near Barang, 12 km from Cuttack, and 20 km from Bhubananeswar, the capital of the State. “Why such a name?” I asked Mr. Lala Susant, a young man in his early thirties, who holds the reins of management of this orphanage and lives nearby. Susant completed his Bachelors of Arts from the Sri Sathya Sai University in 1994, and his Masters from the prestigious Delhi School of Economics. “Well, it is a small effort at recreating the happiness we felt when we lived in the physical presence of Bhagavan at Prashanti Nilayam. The virus of loneliness, born of alienation from God, is destroying the world. Some of us, students of Bhagavan, wanted to share our Godly joy with the world, by trying to create an oasis of love and service - for that is what happiness is all about - in a desert of lovelessness. Thus, with the inspiration of Swami was born “Sai Anandam”. 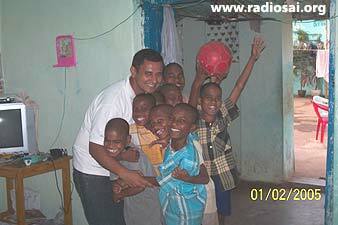 “Why did you choose to set up a home for destitute children? You could have worked on any other project”, I queried again. Twelve year old Naresh is studying in VI grade in the nearby Jhunjhunwala High School, like every other child in Sai Anandam. He came to Sai Anandam 9 months ago from Baanra, near Banki. He had lost his father and was being raised in very difficult circumstances by his mother, who is mostly bedridden. Though he is so young, he knows the responsibility that he is going to shoulder soon. He wants to become capable enough, take up a job a few years from now and take care of his mother. As he talked, his eyes inadvertently would find their way to the life size photo of Swami whom he had known only a few months ago. While gazing at the picture, he would delight in affirming, "He is God and He has created this beautiful Universe including me." His eyes were eloquent enough to narrate this wonderful love story between him and the Lord. “We thought this is the best way to create an environment of love and service. Children are the best gifts of God to humanity, and we were shocked to see how so many kids receive so little care in our ‘civilized’ society. So we made inquiries and found some children who were disadvantaged by having only a single parent, or had no parents, or due to utter poverty, were living almost on the streets. If they were allowed to grow with this emptiness in their lives, with no remedial action taken, they may either remain as a burden on society, or turn into criminals. We wanted to bring to them Bhagavan’s Love and show them the light of happiness that guides our lives.” Susant looked joyful; satisfied with himself for having made a good decision. I remembered a Vedic hymn where the rishi (sage) declares at the top of his voice, “Beyond all this darkness, I have seen the Light of God, which is a thousand times brighter than the sun…..” (…vedahametat purusham mahantam, adityvarnamtamasah parastat...) I knew in my heart that the Light of God alone can transform our lives. Ananda (bliss) is the only food that can restructure man into God, and who can do that better than Bhagavan’s students, who have experienced so much at the Feet of the Lord? 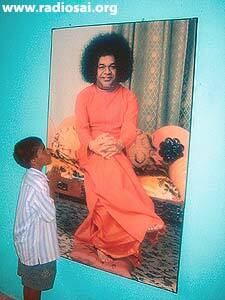 Doesn’t Swami often reiterate ‘Ananda is My ahara’ (Bliss is My food)? We enter the unassuming campus of Sai Anandam. A small arched gate, a courtyard flanked on both sides by two blocks of very modest halls divided into two or three rooms each, an asbestos roof covered with hay for fighting the terrible summer heat, and ten pairs of tiny feet, eager to tread the path to love and happiness they had missed all their lives. Guiding them with great affection are a few young men in their twenties and thirties. This is Sai Anandam. They don’t have an office, no furniture except a few plastic chairs for guests. But what they do have is - big hearts, the passion to build men of virtue out of homeless urchins. 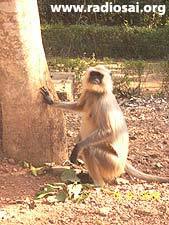 Hari hails from Barkoli Khada in Jagatsinghpur district. A bright student of class V, he loves reading literature. He joined the home nine months ago and since then has shown promise in playing tabla and other percussion instruments. His tender heart cherishes many dreams. He wants to grow up and join the Indian Police force as he wants to fulfill his late father’s wish. It is salutary to recollect the innumerable instances when Swami would come and ask the tiny tots of Primary School in Prashanti the same question and hear the same answer. At that moment, His heart would swell with pride and a smile would slowly find its way to His face. Of the two blocks, one contains the kitchen and a room for the older inmates. The other block is divided into two rooms, 15 by 12 feet, and 20 by 12 feet. The smaller room serves as the puja room, where the inmates say the suprabhatam (morning prayer) and other prayers. In the other larger room, they study and sleep. Mats spread on the floor are their beds, and they share and care for each other in every way. They clean the campus - their home, and wash their own clothes too. 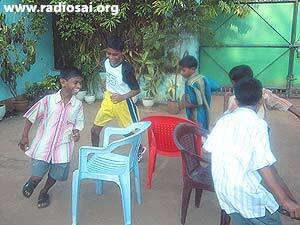 To study, they go to a nearby school, and in the evenings, play together indoors. 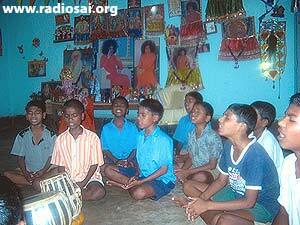 Everyday, on the onset of dusk, they sing bhajans, and listen to stories of Swami’s life. As they are starting almost from scratch in formal education, a retired teacher voluntarily coaches them to remedy the long years of neglect. They rise at five in the morning, and slip into sleep at ten every night. “We wanted to give them the schedule we lived at Puttaparthi”, explained Satyaswarup Patnaik, another former Sai student involved in this noble project. Satyaswarup did his XI and XII grade from the Higher Secondary School at Prashanti Nilayam in 1998, and went on to study medicine. A medical graduate (MBBS) now, he is currently pursuing his Masters (MD). “Early to bed and early to rise, keeps a man healthy and wise, Bhagavan used to tell us”, he continued, “besides, it gives one enough time for a planned life. So, we introduced the same schedule. They start the day with prayer, and end it too with His Name on their lips. We want to recreate here our life with Bhagavan at Prashanti, for what can be better than that?” he said, his large eyes looking even larger. We are led to the bigger enclosure which is the ‘boys’ room’. Here they live and laugh, study and sleep. It was a wonderful feeling. We felt closer to deprived humanity, and our well-pressed clothes humbler. A couple of older inmates sat around us, while others went to oversee the lunch session. A funny idea struck me and I wanted to find out the level of understanding of these boys. After the boys sat down, face to face, in two rows, for their lunch, I asked one of the young men there to tie a foot long stick to their right hands in such a way they can not bend it at the elbow (which is needed if you want to eat). Six boys were chosen for the experiment. Susanth and his sister were bereft of the affectionate touch of their mother and father for a long time, having lost both of them while babies. As little children, they had locked shut their hearts, and with this, any fragrance of hope. They could only watch, while any possibilities of respite dissolved in the harsh reality that surrounded them. Fortunately, fate smiled and Susanth was taken into Sai Anandam 9 months back, while his little sister now stays with her maternal aunt. If he had continued to live in that situation where no sprouts of parental love germinated, it is likely he would have grown up embittered, out of touch with a society which had abandoned him in the gloom of loneliness. But all those clouds of despair and desolation have given way to a brighter future and aspiring dreams. Susanth grooms a strong ambition to become a doctor just like his mentor and inspiration Satya Swarup Pattnaik. 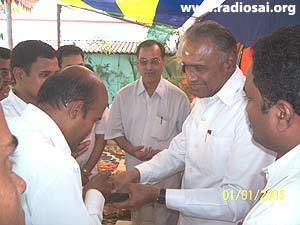 He wants to help everyone who is distressed not to undergo the same suffering he had undergone for many years. Where one lives for the other...thats heaven! I felt chastened, and appreciated the effort of the youth guides there, but they simply said, “It is all Bhagavan’s work. The boys are learning very fast”. It must be true. The presence of love was palpable in the campus. He is the head of the family, looking after their physical and spiritual needs. “What else do you teach the boys?” I asked Lala Susant. He pointed at another exemplary student of Swami, and says, “Manas comes here every Saturday from Bhubaneswar and teaches them tabla (percussion).” A young man in his early twenties, Manas Das did his tenth from the Higher Secondary School at Prashanti Nilayam in 1999, and is currently doing his Masters at ICFAI (Institute of Chartered Financial Analysts of India) in Bhubaneswar . I asked Manas, “Why do you take the trouble of traveling more than 15 km every Saturday to come here? Softly, he said, “I like to come here and do something for the boys. I always feel Swami’s Presence here. 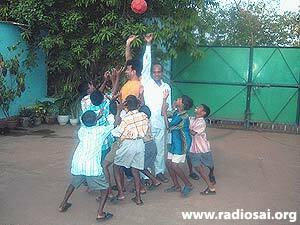 I think this is the best way to remember Bhagavan.” “We teach them the Bal vikas course too,” Susant added. Yes. The best way to remember God is to do what is closest to God’s Heart. And what could be closer to His heart than loving service? A small story of Jesus popped up in my mind. Once Jesus asked his disciples, “A father had two sons. The elder one always stayed with his father, [and] followed him wherever he went. The younger one, came to his father in the morning, took instructions for the day’s work, and went away. He came again to his father in the evening to report about work. Who do you think was dearer to father? The one, who said, ‘Father, Father’ all the time, and did not do his bidding, or his brother, who called him once or twice a day, but did his bidding?” And Jesus answered his own question, “Obviously the younger one”. Bhagavan says, He is as far away from us, as we are from His words. The picture beside is of Mr. Dharjyadhara Sahoo and his wife, without whose benevolence, Sai Anandam would not exist in its present form. The project actually runs in the house they donated. Initially, he was approached to find a rented house for Sai Anandam. After a few days, he said that he had an outhouse which the Sai students could use on rent. After a week, when they went to see the house, out of the blue, he offered his own house - free of rent. The Sai alumni were surprised, but he explained that a few months ago, a holy man had foretold that his house would, one day, be used for a noble cause. “I think Sai Anandam fulfils that role; my family concurs with me,” he said. 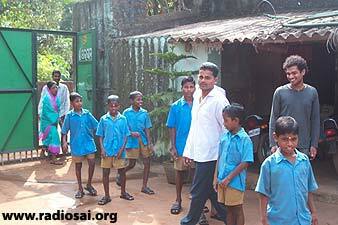 They happily moved out to the smaller outhouse and left Sai Anandam, their main house, to start the noble endeavour. The couple is never tired of stating how they have never known such happiness as watching the children being taken care of in their house. 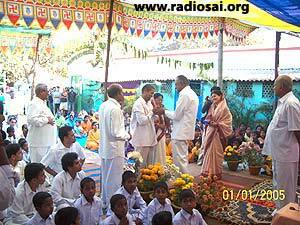 “From the inception of the ashram, it has been Swami’s project. We have felt His guiding Hands at every stage. He is the Doer, we are the deed”, Susant whispered aloud with great reverence. “You don’t have to. It is done at the Bank of God, and we receive currency notes for His work. We were only one month old, and one evening I discovered our cash box was empty. We didn’t have a rupee to buy our next meal for the boys. 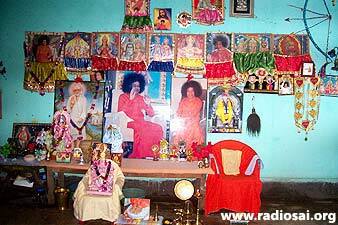 I went to our puja room, and told Swami about it. I told Him it was His job now to feed us. 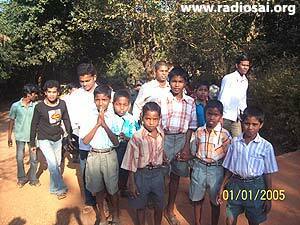 Next morning, I received a phone call from a Sai brother to come and collect five thousand rupees for the boys. 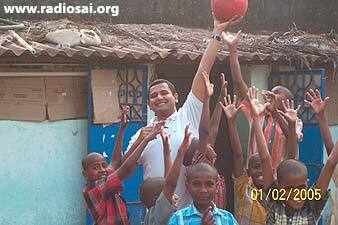 You never know the power of surrender until you practice it,” Susant assured me. I had no words to contradict him. 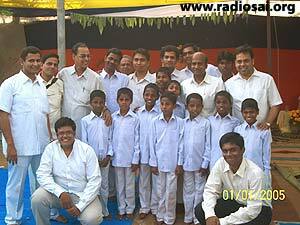 “We started Sai Anandam on August 2007. Till now, we haven’t run into a blind corner. We have never felt the need for asking anyone for donations. All that we need comes unasked. 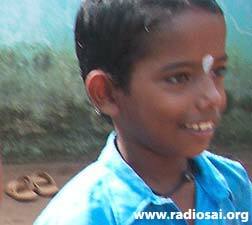 Doesn’t a mother know the need of her child?” The joy in the eyes of Susant was infectious. “However, some of our fellow students contribute some amount on a monthly basis. One of them saves from his Ph. D scholarship for us, another from his pocket allowance his father gives him, for he is still a student. A third has a small job, but remembers her monthly offerings. One more student pays the salary of one employed worker. 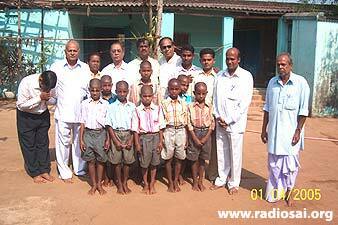 Of the six alumni who regularly contribute for the cause, one lives in Prashanti Nilayam. 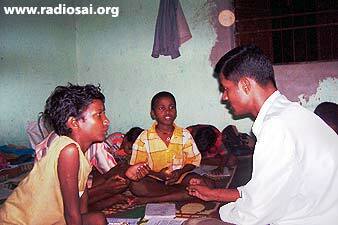 There are some Sai devotees too who help us on a regular basis. 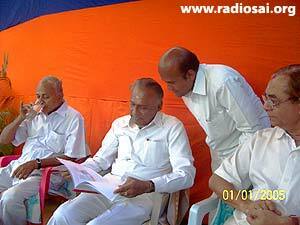 We never forget Bhagavan, and He never forgets us”, Susant concluded. I shifted to another area. “You are completing a year of Sai Anandam this August, and as I understand it, the boys have come here at various stages. Do you see any perceptible improvement in them?” I asked him. Niranjan Das is blind and begs for a living. This is the only way he was taking care of his wife who is suffering from tuberculosis and his son Nigam. It was going beyond the point of human endurance and struggle for a meaningful existence when something happened. Then, as Nigam says – “God brought me to Sai Anandam”. 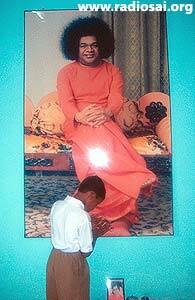 He had heard of a person by name Sathya Sai Baba and the bhajans from the local Sai centre of Pareswarpur village. But it was only after he joined Sai Anandam that he felt the cool breeze of Divine love soothing his mind and spirit. It was the turning point in his 12 years of life. One can clearly see how Nigam's spirit is soaring and taking flight with the wings of carefree abandon and love in this environment. Nigam shows lot of promise in his academics and loves English literature. He speaks the language fluently, his skill surpassing even an English medium educated urban child. If one asks him now what is the secret of happiness, the prompt reply is “Sai". How true! Life with Sai is endless hope, and life bereft of Him, a hopeless end. His parents’ life too began showing changes, and it started with their eating habits. Having lived mostly on a non-vegetarian diet all their lives, suddenly they became complete vegetarians. I wanted to verify his statement, and called a tall boy from among them. "Oh God, give me a good mind." “Susanta Behera” he answered politely. “Sai Baba is my Father and Mother. These brothers love us. They give us good food and send us to school. They have given us a nice house to live in. I am very happy here”. This boy has lost both his parents. I was pleased to find that the idea of service had already made an impression on his 12 year old mind. I picked up another boy. "You are my father, mother,.. everyhing"
Then there was this Naresh Beura, an 11 year old. He has no father, and his mother works as a daily labourer. He wants to take a job soon to look after his mother. 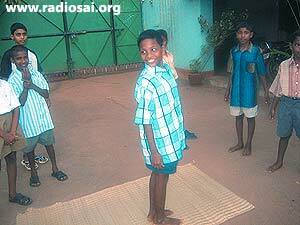 Prashant Behera is a ten year old, whose father has deserted his mother, leaving her with chronic mental ill-health. He also wants to grow up fast to care for his mother. Manoranjan Moharana’s father is serving a life sentence. His mother is supporting another son and a daughter by daily labour, but is very happy that Sai Baba is looking after at least one child. Manoranjan would ask for Sadbuddhi (Good intellect) if he meets Swami. Nigam’s father is a blind beggar, and his mother suffers from Tuberculosis. They have given up even occasional non-veg eating after their only child joined Sai Anandam. 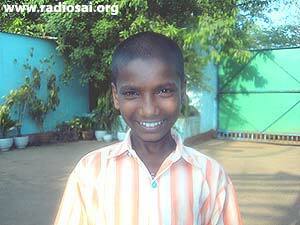 Nigam was a terribly depressed child before he joined this place, but not now. Saiprasad Khatua is a Vibhuti child. His parents are Sai devotees, and early in life when he was on his death bed, Vibhuti saved his life. He is the youngest of the group, at 8 years old. This is the boy for whom Swami solves even mathematical problems. Ten year old Prashant Behera from Baranga is an avid swimmer. He belongs to the fishermen community. Swimming in the river and playing with his friends were his favorite pastimes. And then life took an ugly turn when his father abandoned his family for another woman. 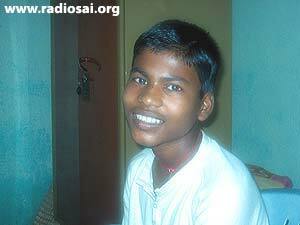 Since then, his mother lost her mental balance and became a recluse – roaming on the streets and living on handouts. Only a dilapidated hut saved them from the ravages of the seasons. 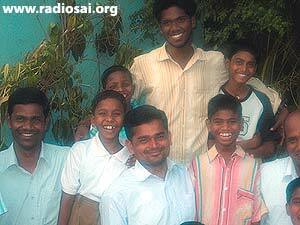 When the Sai Anandam team found the entire family in such a condition, they immediately placed Prashant under the loving care of the Lord of Prashanti Nilayam. They also provided the mother with blankets, clothes and occasionally food. She thinks that her son is with Sai Baba, and is therefore, content. How true! Prashant plays tabla for the evening bhajans and has an eye and flair for stage decoration. 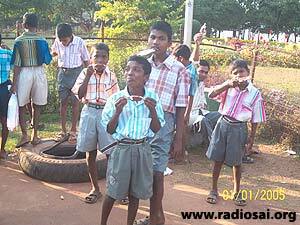 Manoranjan Moharana, is ten years old, and just like the other children, his childhood has been haunted. His father is languishing in jail with a life imprisonment sentence. His mother has been able to make ends meet and raise her other two children by working as a daily labourer on a construction site. 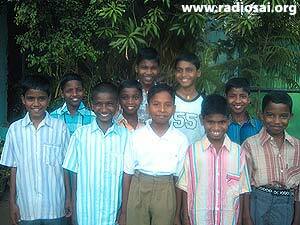 They live in a hut which the local youth from the Sri Sathya Sai Seva Organization built for them. Life is difficult and her other children (a younger son and daughter) do not have much of an opportunity to learn the meaning of such far off words like – ‘choices’ or ‘preferences’. 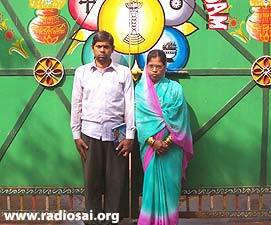 Her mother is happy, at least her elder son, Manoranjan is able to lead a better life in Sai Anandam. There are 12 boys in this divine home. “What are your future plans for these boys? 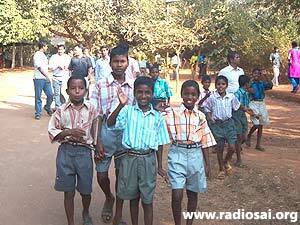 How long would you support them?” I asked Susant.  “We generally think of supporting them up to X or XII grade. Then we will give them vocational training, and set them up in a job. But if we find anyone really worthy of pursuing a higher course, and Swami enables us to support him, we will gladly do so”. Silently listening with us to this beautiful story of love and service, was Dr. Mohapatra, a self made artist and sculptor, a senior Reader in Commerce at Ravenshaw College , a deemed University in Cuttack . He immediately offered to come to the ashram at regular intervals to teach the boys art and artistic values, and help them in some handicraft projects. We were very glad. Bhagavan’s Hands were visible. 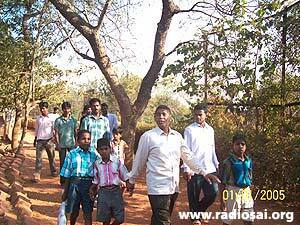 They felt the unseen Presence of the Lord even more when, all of a sudden, the All India President of Sri Sathya Sai Seva Organisations, Mr. V Srinivasan, paid a visit to this Sai home of service on January 18 this year (2008). It was a memorable day for Sai Anandam. The distinguished instrument of the Lord spent about 45 minutes with the inmates, and even delivered a short address to the inmates and the people gathered there. Before he left, He generously contributed to their resource-pool and also distributed T-shirts to the boys. I met the young man. 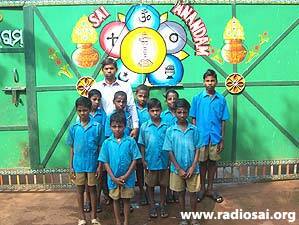 Dukhishyam has done his XII grade, gave up his earlier job in an iron and steel company to join Sai Anandam. A tall youth, with a well defined face, always eager to learn how to be more useful in moulding the boys into useful citizens. This is the only way he could serve Swami, and hopefully get closer to Him, he says. I met three other local young men who help with the boys in various ways. 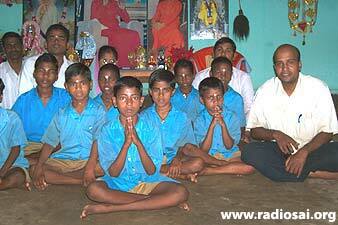 One of them is doing a Bachelors in Computer Applications, who teaches them bhajans and mathematics. Kalindi is a graduate, associated with the Home from the beginning. He is paid Rs.1,500 per month, stays most of the time in the ashram, and does any odd jobs. He is happy to be associated with this home of love and service. 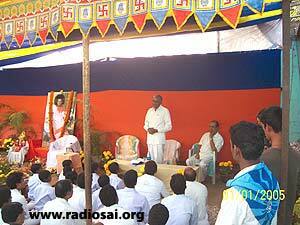 He says he has improved spiritually to a great extent after joining the ashram. Rakesh is doing his graduation, and pursues videography as a profession, but spends all his spare time with the boys, teaching, and looking after them. A happy and carefree young man, he is grateful to Swami for his association with the Sai students, which saved him from the usual evil ways of the modern youth. It is a great love story, I thought. Mr. Vivekananda Sahoo, an alumnus of Sri Sathya Sai University, who too visited this nest of love, reflecting later on this ennobling experience, said, “These children, like tender saplings, need a protective fence. What they need, more than food, clothing and shelter (though they need these too, desperately) is to feel wanted. It is their label ‘outcast’ that imposes upon them the most agonizing frame of mind. Denied of love by the world around, these saplings perish. A few who live through all harsh reality, bearing the deep scars which are the gift of their cruel home, are often deemed misfits in society. Who is to be blamed: The tender saplings or the merciless world around them? Are we a part of this cruel world or can we make a difference for these less fortunate blossoms? 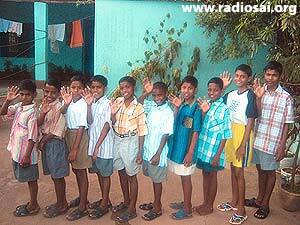 1) To foster all mankind and ensure for all of them lives full of Ananda (bliss). 2) To lead all who stray away from the straight path, again into goodness and save them. 3) To remove the sufferings of the poor and grant them what they lack. As I pondered over what I saw and experienced, and the reflections of another inspired Sai student, I realized why the world doesn’t end with a bang, though it is said to have started with one. It is because such love stories, amazingly designed and developed by the Divine, never end. The good and kind Lord lives in His devotees, who live for Him. To access all the previous issues of Sai Seva, please click here.